High above recently captured Rabaul, New Britain, and piloting a fully loaded B-17E Flying Fortress, Capt. Frederick “Fred” C. Eaton, Jr. had just spotted his target – a 10,000-ton enemy freighter. As he lined up to unleash his payload, the bomb bay doors malfunctioned. The crew worked feverishly to open the doors as he circled for a second attempt. Japanese anti-aircraft batteries zeroed in on the lone bomber’s altitude and unleashed a hellish barrage, damaging the wings. This second time the young Captain once again carefully lined up their course and once again got the Japanese ship accurately targeted in their Norten bomb sight’s cross hairs. 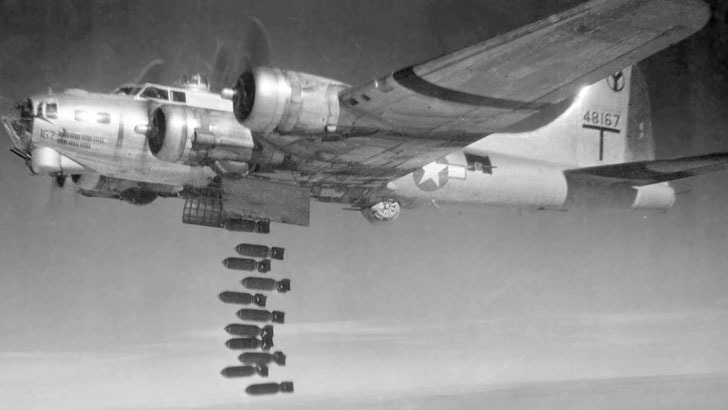 This time, thanks to the crew’s technical skills, the doors opened and the bombs fell toward their target. But, as if on cue, Japanese fighters swooped in, guns blazing. Eaton and his crew were in a fight for their lives. The aerial battle raged, bullets and cannon shells riddling the Flying Fortress as it ran for cover. 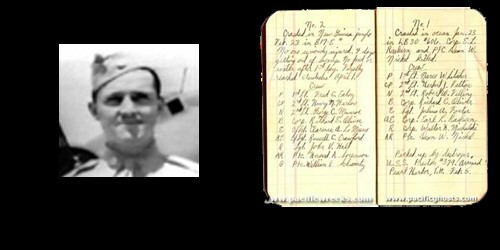 In the skirmish, tail gunner John Hall claimed an enemy aircraft while waist gunners William Schwartz and Russell Crawford added two more claims to the tally. In the aftermath, Eaton believed the port wing was severely bleeding fuel from an un-exploded flak round. Knowing he wouldn’t reach the safety of the refueling field at Port Moresby, New Guinea, he flew as far southwest as the fumes could carry them. Salvation revealed itself just as the crew determined the stricken bomber couldn’t climb over the towering Owen Stanley mountains — as an isolated swamp in the foothills of the New Guinea mountain crept into their range. Eaton skillfully glided the heavy aircraft into the swamp water for a wheels-up landing. The B-17 slewed sideways and settled in the deep kunai grass without even breaking up. Despite the running battle and the crash landing, there were zero casualties. Six weeks and dozens of malaria-infested miles later, Eaton and crew finally reached safety. 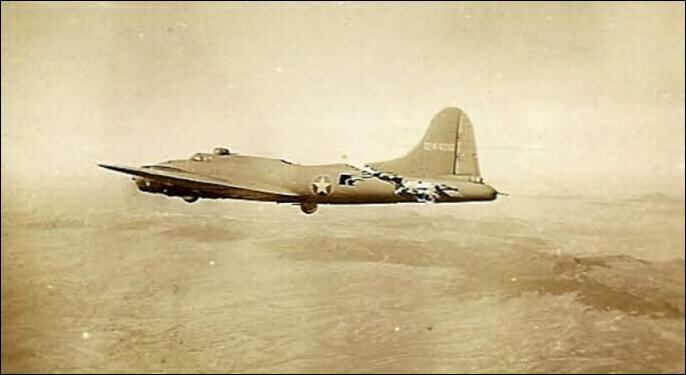 The heroic crew was assigned another B-17 and continued to successfully fly for the rest of the war. For more than seven decades, that lucky Boeing B-17E Flying Fortress, serial 41-2446, lay intact and virtually undisturbed, all but forgotten. In 1972 it was spotted by a Royal Australian Air Force helicopter and the local press dubbed it the “Swamp Ghost.” It is not the historical name of the bomber, but it is the name history has chosen. Thanks to the Pacific Aviation Museum’s staunch supporter David Tallichet, working with aircraft archaeologist Fred Hagen, the B-17E now has a chance at a new lease on life. Now housed at Museum’s Pearl Harbor site, Swamp Ghost is arguably the world’s only intact and un-retired World War II-era B-17E bomber, a one-of-a-kind example of an aircraft that played an indispensable role in winning WWII. 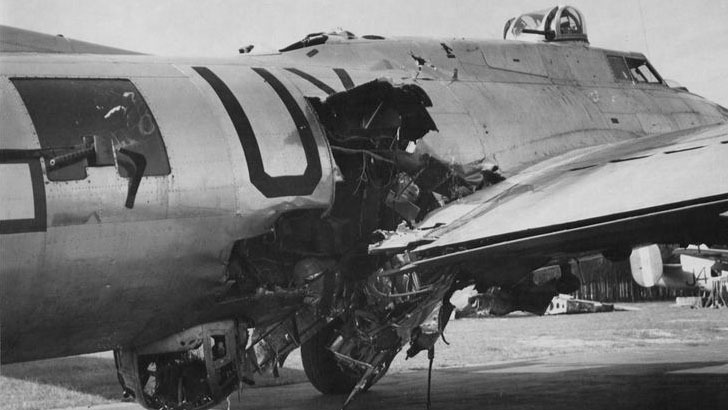 And it is the only B-17 in the world that still bears its battle scars. 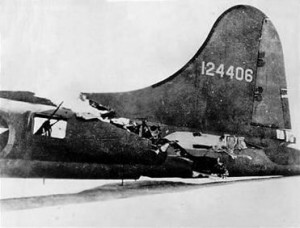 One of most famous B-17 damage photos from WWII where its tail miraculously stay put . . . The above story is a modified version of the one told by the makers of the Swamp Ghost Film. The iconic B-17 was widely revered during WWII for its many amazing survival stories. 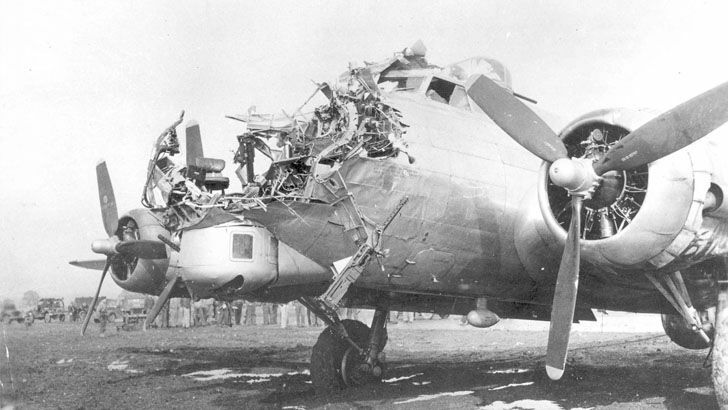 While many were lost in battle, a few besides the “Swamp Ghost” survived their bombing runs with unbelievably severe damage, yet somehow still managed to return home to their bases, thereby carrying their crews back to home turf safety – – – to continue their successful missions to destroy the enemy, whether in the European-African theater or that of the Pacific, as was the case of the Swamp Ghost’s crew. Born on December 20. 1922 and passed away on October 31, 2007. Tallichet was born in Dallas, Texas, to David Compton Tallichet Sr. and Margaret Tallichet. After completing high school, he studied at the University of the South, University of Texas, and Southern Methodist University. With America’s entry into the Second World War, David signed up for military service. Pursuing his love for aviation, David joined the United States Army Air Force and was accepted for flight school where he successfully completed advanced flight training and was assigned to training on the four-engine Boeing B-17 Flying Fortress bomber. He was then assigned to a crew and they flew a B-17 from the United States to Britain. Once in Britain, he and his crew became part of the 350th Bombardment Squadron, 100th Bomb Group, based at Thorpe Abbot. From this location, David and his crew flew 23 combat missions before the collapse of Germany and V-E Day. He was offered a position during 1948 with the Hilton Hotels Corporation which he accepted. During 1955, David took the position of General Manager of the Lafayette Hotel which was located in Long Beach, California, and owned by Conrad Hilton. This would lead to a further career move that saw David and two partners obtain a lease with the Port of Long Beach and the opening of The Reef Restaurant during 1958. The opening of the Reef Restaurant was a pivotal point for David’s Specialty Restaurants Corporation which would go on to encompass over 100 successful restaurants located across the nation. Tallichet is generally credited with being one of the industry’s true theme-restaurant pioneers; with such ventures as the Sunbird, Pieces of Eight, Shanghai Red’s, Ports O’ Call, Proud Bird, Castaway, 94th Aero Squadron, Crawdaddy’s, Baby Does Matchless Mine. In the late 1960s David decided to begin collecting and restoring WWII aircraft to flying condition. He soon would develop the world’s largest collection of privately-owned flying WWII aircraft. He was often called upon to provide historic aircraft for films. He was able to fly his B-17 across the Atlantic to Britain to take part in 1990’s Memphis Belle. This past July, David took his Flying Fortress to an airshow in Michigan where he was honored as the last WWII combat pilot still flying one of these very rare aircraft. David Tallichet is survived and loved by his wife Carol Margaret Tallichet of Orange, California; daughter Catherine Ann of Jackson Hole, Wyoming; sons William Robert (Wife Jasmin: children Ashley and Catherine) of San Pedro, California; John David (Wife Karen: children Bryan and Lauren) of Newport Beach, California; and James Lee of Jackson Hole, Wyoming. This entry was posted in AVIATION NEWS on January 26, 2017 by FASFRIC.